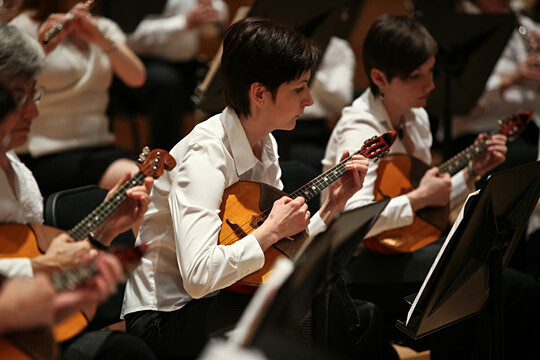 For the core followers of the American Balalaika Symphony, and for the 50-plus volunteer musicians who travel for miles around the tri-state metropolitan area to play in the group, associations with the balalaika run much deeper, reflected in the group’s layered sound and diverse repertoire. So what does a balalaika symphony sound like? The group is built on a core foundation of balalaikas and domras, 3- and 4-stringed instruments that are held like guitars and plucked or strummed. The distinct tremolo style creates a shimmering sound that is simultaneously light and deep, breaking any connotations of simplicity that such minimalist-looking instruments may carry. 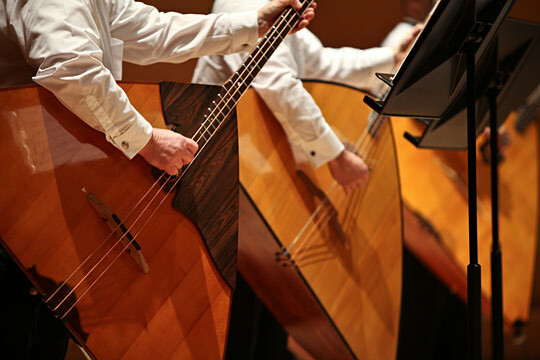 The varying sizes of balalaikas and domras (each instrument family comes in prima, alto and bass voices, and more) lead to a sense of versatility as well. Identifying themselves as a full-fledged symphonic orchestra complete with woodwinds and brass, Maestro Trofimenko pushes the group beyond the typical orchestral repertoire with pieces that range from arrangements of Strauss and Tchaikovsky to jazz, rock and pop. And according to Maestro Trofimenko, it is that exact sense of diversity that audiences come to hear at an American Balalaika Symphony concert. They also come to push their auditory senses into new realms of sound and texture. Maestro Trofimenko invites you to experience the rich sounds of the American Balalaika Symphony for yourself. The symphony will be performing this upcoming weekend, on Saturday, May 12, 2012 at 8 pm. The concert will take place at the Rachel M. Schlesinger Concert Hall on the NOVA Alexandria campus. Advanced tickets are sold until noon on the day of the concert ($20), as well as at the door ($25). Photo credits: The American Balalaika Symphony.